My home theater is in a family room that is 12' wide by 19' long. The couch is at 8' from the TV. I currently have Paradigm titans v3 hanging from the ceiling as surround (5.1 configuration) but I want to replace them with dedicated side surround speakers that will be positionned on the wall at 3' from each side of the couch. 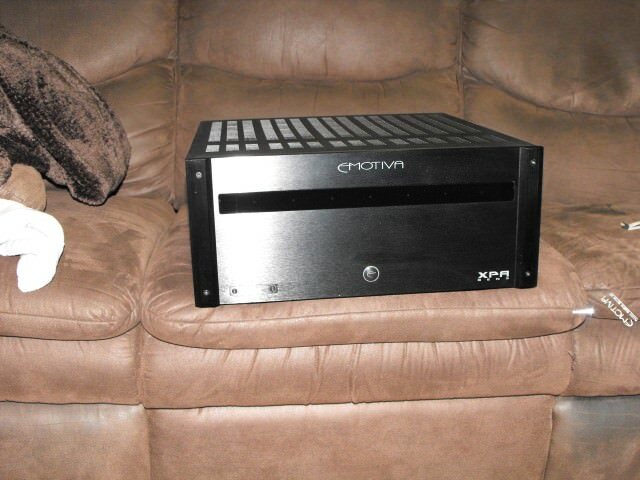 The receiver is a Yamaha RX-V667 and I do not want to change it. I would like to know with the size of the room which surround (QS4 or QS8) will be sufficient for the room size. On the Yamaha, I usually go from -40 to -30 sound level when watching a movie. Could I use on wall speakers (like the M3) instead of dedicated surround speakers for the home theater? Are you ever going to consider Atmos or dtsx? Since you say you dont want to change your receiver i dont think atmos is on your radar. I started with QS 4's and moved them to a smaller room and went with QS8's which in my 15x15 room work great. I have found having them up close to the ceiling works best.They are great surround speakers. Since you have nice tower speakers, I would think that you would want to go with larger surrounds. QS8s would be my pick honestly. There is more depth and capability with the QS8s that you will appreciate. defiantly go with QS8, if not at least QS4. You will see immediate improvement in sound. Currently I sold my v2 QS8 to my son, put a set of QS8's on layaway. While I am waiting I have a set of direct speakers there. I cannot stand that every time a sound comes from the side rears I can localize the sound directly. It's like listening to music and hearing the singer in both left and right speakers. Well, I'm going to tell you something you don't want to hear. Get rid of the receiver. Not right away, but when HDMI 2.1 becomes standard you'll have no choice. That's coming sooner than later. Then you'll have a receiver with Atmos capability. My room is near identical in size, maybe a touch larger, but qs8's are the way to go for you right now. Killer is, if a year or two from now you do want to try Atmos...you got the wrong speakers. The on walls would be better. Just something to keep in mind. Yes, right now I do not have any intention to change my receiver or use Atmos. However I will go from 5.1 to 7.1 at some point. Back wall is around 10 feet behind the couch. I guess that the on-wall M3 could be on the back wall and the qs8 will be on the side walls. What about QS10's? They also have the driver that fires directly into the room. While it's the larger driver and there presumably won't be much content for surrounds below the lower crossover range, it might help a bit with the back wall distance. If QS10 not in your range, then go QS8. Again, only for traditional 5.1 or 7.1. Atmos and the object oriented surround formats want direct firing speakers to work best. FWIW, my in-laws have an all Paradigm system with ADP surrounds - I'd take my QS8 over the ADP's any day. The QS8's have an uncanny ability to be both diffuse and precise when needed. I find the ADP's somewhere in between without excelling at either. The QS speakers really do a great job on delivering a difuse area sound into a room. I don't know why you would want M3 on the back wall where a QS would do just as well in not better job. The one and only reason that Atmos spec calls for direct firing speakers is that the implementation of the tech allows for the head unit (receiver) to simulate a more defuse sound by firing out multiple speakers but then as well be able to give the pinpoint accuracy when needed. If you are not springing for a fancy Atmos setup with 11 speakers then you are far better off sticking with the QS.